Dozens of drinking water and wastewater facilities in Texas are not operating or are destroyed because of Hurricane Harvey. President Trump nominates top EPA water official and appoints a regional EPA administrator. Mining company proposes expanding Nevada gold mine then treating the wastewater to grow alfalfa. Interior Department investigators can neither confirm nor disprove irrigation fraud in Klamath River Basin while EPA investigators look into Scott Pruitt’s Oklahoma travel. And lastly, Congress is back from vacation: Time to talk budget, flood insurance, and Hurricane Harvey aid. “It’ll be a long way back for those who’ve suffered much. It will require our ongoing commitment of public resources…and the generosity of businesses and the American people. But beyond that, the president and I know that the best way to ensure the long-term recovery of America’s fourth-largest city, and the Gulf Coast region, and our entire country is robust economic growth, which is what brings me here tonight.” — Vice President Mike Pence speaking on August 30 at the West Virginia Chamber of Commerce Summit about Hurricane Harvey recovery. More than a week after Hurricane Harvey overwhelmed the Texas Gulf Coast, dozens of water and wastewater plants still are not functioning and at least a dozen Superfund sites were flooded, damaged, or both. As of Monday, according to the Texas Commission on Environmental Quality, some 48 drinking water treatment plants were inoperable. Most served a few hundred connections, but the largest, for the city of Alvin, delivers water to 24,000 connections. Alvin is expected to resume all city services today. Also according to the TCEQ, some 33 wastewater plants were inoperable as of Monday, and two facilities were destroyed. The Houston area is a chemical corridor with more than a dozen Superfund sites, most of which were flooded. The EPA, however, did not have an on-the-ground presence through Sunday, according to the Associated Press, which toured the sites by boat. The EPA said that it looked at aerial photos and talked with the companies doing the regular cleanup to determine that 13 sites were flooded. In Washington, D.C., meanwhile, Congress will debate the size of an aid package. The White House requested roughly $14 billion, but House Republicans are using $7.85 billion as a starting point that they will discuss beginning on September 6. A Congressional Research Service briefing identifies issues that lawmakers may address. Perhaps the biggest policy question is reauthorization of the National Flood Insurance Program, provisions of which expire on September 30. According to CRS, Congress might have to increase the insurance program’s debt limit, especially if the program needs to borrow money to pay out claims. The program currently has $1.75 billion to pay claims and $5.8 billion of borrowing capacity until it reaches the debt limit. By comparison, Hurricane Ike, which hit Texas in 2008, resulted in $2.7 billion in claims. President Trump nominated David Ross, director of the Environmental Protection Unit of Wisconsin’s Department of Justice to be the top water official at the EPA. Like Scott Pruitt, the EPA administrator, Ross has been involved in lawsuits against the agency he is nominated to serve. E&E News reports that Ross represented the American Farm Bureau in its lawsuit against nutrient and sediment pollution limits in the Chesapeake Bay. If confirmed by the Senate, Ross will step into an agency that has several high-profile water rulings to complete: revisions to the lead and copper rule, a rewrite of the rule that defines which water bodies are protected by the Clean Water Act, and interim evaluations of the Chesapeake Bay’s pollution diet. In context: Undermanned EPA delays lead rule again. To lead EPA Region 7, which covers Iowa, Kansas, Missouri, and Nebraska, Trump appointed Cathy Stepp, the Wisconsin Department of Natural Resources secretary. Stepp’s tenure in state government was marked by a tilt toward pro-business policies, according to a review by the Milwaukee Journal-Sentinel. Regional administrators do not require Senate approval. Trump also nominated Bill Northey, Iowa secretary of agriculture, to head the U.S. Department of Agriculture’s farm production and conservation division, a program established this spring in an agency reshuffling. Because of a nitrate pollution lawsuit filed by the city of Des Moines against upstream drainage districts, Iowa has been a focal point in recent years in the debate over controlling farm runoff. The House Rules Committee will meet today to go over a budget bill for EPA, Interior, Army Corps and other departments. Besides funding the agencies, the bill includes a provision that allows the EPA and Army Corps to repeal the Obama administration’s definition of the scope of the Clean Water Act without going through the public review process required by law. Rep. Don Beyer (D-VA) submitted an amendment to eliminate that provision. One hundred seventy-three other amendments related to the EPA and Interior were submitted, from requiring an environmental review of the proposed border wall to prohibiting funds for aquaculture in the Great Lakes. The powerful storm broke rainfall records. It also broke geographic barriers. 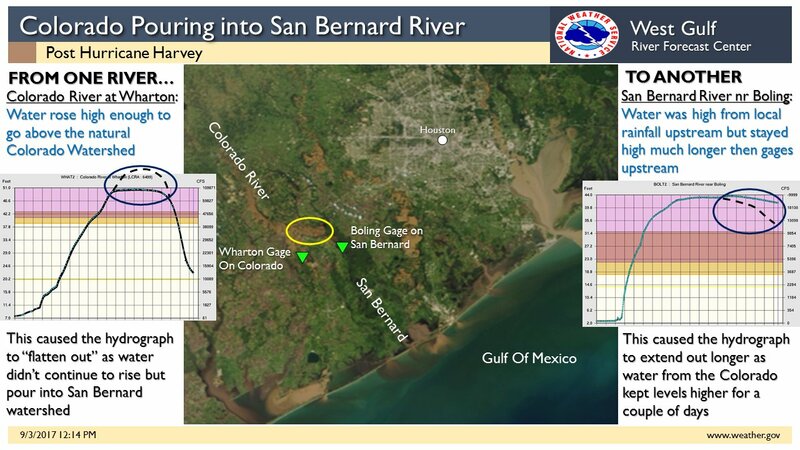 The Colorado River (the one in Texas, not the more famous one) rose so high that water spilled into the neighboring San Bernard River watershed, the National Weather Service reports. The Bureau of Reclamation and local partners will evaluate water availability and demand in basins in Arizona and New Mexico. The studies will assess options for managing scare supplies. The Arizona study will look at the Eloy and Maricopa-Stanfield groundwater basins, located in a corridor with primarily agricultural use between Phoenix and Tucson. The New Mexico study, meanwhile, centers on the Rio Grande Basin. At the request of Congress, the EPA Office of the Inspector General is scrutinizing Administrator Scott Pruitt’s travel to his home state of Oklahoma — travel that includes his bodyguards. Investigators will look at how often Pruitt traveled to Oklahoma through July 31 and how much the trips cost, all with a goal of preventing “fraud, waste, and abuse” of taxpayer money. Interior Department investigators could neither confirm nor disprove the allegation that farmers in the Klamath River Basin of Oregon and the Bureau of Reclamation wasted money on a drought program. The farmers allegedly irrigated their fields despite receiving payments from the Bureau of Reclamation not to irrigate. A department audit of the program last year concluded that $32 million was wasted, but now investigators say that they can’t prove that funds were misused. Newmont Mining plans to expand a gold mine in central Nevada, extend its operation by 23 years, and, once the mine closes, use the waste water to grow alfalfa, according to a draft environmental review. The Greater Phoenix project would increase the amount of land use for operations by more than 40 percent. After 2063, the storage facility for the tailings, aka metal-laden waste water, would be capped. The water would be treated, blended with groundwater in a one-to-one ratio, and used to grow alfalfa on the site. Submit comments on the draft via blm_nv_bmdo_GreaterPhoenixProject@blm.gov. Starting September 11, the Army Corps of Engineers will hold three public meetings to discuss recommendations for keeping the unwanted fish out of the Great Lakes. An Army Corps report published last month offered a number of options for harassing the carp. But it did not recommend closing a pivotal lock that connects the Mississippi River Basin to the Great Lakes. You can watch and participate in the meetings from afar. They will be webcast, Facebooked live, and teleconferenced. Instructions for all three are in the above link. Federal Water Tap is a weekly digest spotting trends in U.S. government water policy. To get more water news, follow Circle of Blue on Twitter and sign up for our newsletter.